In The Happy Prince by Oscar Wilde we have the theme of dedication, compassion, generosity, struggle, appearance, sacrifice, selflessness and corruption. Taken from his The Complete Short Stories collection the story is narrated in the third person by an unnamed narrator and after reading the story the reader realises that Wilde may be exploring the theme of sacrifice and compassion. The Happy Prince rather than looking as one would expect a Prince to look ends up in a broken and dishevelled state because of his generosity and care for others. 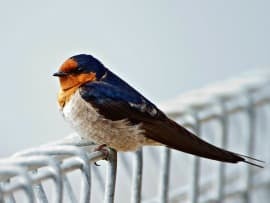 By telling the Swallow to take parts of his body the Prince is using his body and the precious stones and gold that adorn his body in a constructive and practical manner. He is helping those in the town who are less fortunate than him and who need a helping hand. This may be important as the reader would expect the Mayor and the local Councillors in the town to be responsible for the well-being of the citizens of the town but this is not the case. Something that is clear to the reader when the Mayor suggests that the Happy Prince should be replaced with a statue of himself. If anything Wilde may be highlighting the selfishness of those in authority. Rather than looking after others they are looking and thinking only of themselves. They do not see the poverty that exists in the town nor do they see the struggle that has overcome so many of the citizens in the town. Wilde also appears to be exploring the theme of appearance. While the Happy Prince is adorned in finery he is judged to be a symbol of prosperity in the town. Yet when his finery disappears and he no longer looks as attractive as he had previously been. The Mayor and the Councillors want to remove him. If anything the appearance of the Happy Prince is more important to the Mayor and the Councillors than the idea of helping the other citizens in the town. The Happy Prince throughout the story is the only one who thinks logically and practically. He knows that his ruby, sapphire and gold is worth more to those in need than it is to him. In reality the Happy Prince sacrifices everything that he has, including his eyesight, in order to help others. Yet the Mayor and the Councillors do nothing to help others. Being too preoccupied with their own sense of self-importance. For the Mayor and the Councillors their roles in the town mean more to them than actually helping the people of the town. They are driven by their egos and the self-belief that they know best. Yet many in the town live in poverty. Though it is clear that the Happy Prince has made a sacrifice, so too has the Swallow, He has left it too late to fly to Egypt and as such the cold of winter kills him. This is important as it highlights just how dedicated the Swallow is to the Happy Prince. On several occasions he could have abandoned the Happy Prince but choose to stay with him as the Happy Prince helped others. If anything the Swallow has served the Happy Prince well even though he did pay the ultimate price for his actions. How powerful the Happy Prince’s feelings for the citizens in the town is also noticed by the sadness he feels when he sees them struggle. It is this sadness that triggers the generosity and practicality of the Happy Prince. Though the Happy Prince knows that he is being stripped of everything he possesses he continues to help those in need. He can see that there are others who are more in need than himself. At all stages in the story the Happy Prince is concerned more about others than he is about himself. He is selfless. The fact that the Happy Prince’s leaden heart can’t be broken or melted down at the end of the story is also interesting as symbolically this suggests a degree of strength and goodness. Something that becomes clearer to the reader when Wilde introduces a biblical ending to the story and the Angels take the Swallow and the Happy Prince’s heart to heaven. It may also be a case that Wilde is suggesting that both the Happy Prince and the Swallow have lived their lives as God would like others to live their life, hence their ascension to heaven. Whereas it becomes clear to the reader that those in authority in the town are thinking only of themselves and not of the poor and needy. The Happy Prince and the Swallow gave their all in order to help others yet no other character in authority has done likewise. There is an element of corruption in the town among those in authority and the reader feels as though there is no one left in the town to match the spirit and generosity of the Happy Prince and the Swallow. Who are no longer deemed to be appropriate symbols of the town yet God sees it fit that they should live by his side. Having lived their lives helping others and sacrificing all they have in order that others can survive and prosper. McManus, Dermot. "The Happy Prince by Oscar Wilde." The Sitting Bee. The Sitting Bee, 23 May. 2017. Web. Why did the Mayor and the Councillors want statues of themselves? They considered themselves to be more important than they really were. They also wanted to boost their own egos. The main theme is that if you do good for someone, you will get good later, like prince has devoted all his wealth even he looked ugly but after that God give him reward. Thanks it’s a good theme? Can you explain the aesthetic word in this short story. I would need to read the story again.